Candice Meneghin serves on the board of the Fillmore and Piru Basins (FPB) Groundwater Sustainability Agency as an environmental representative for the Santa Clara River Environmental Groundwater Committee. She also serves on the board of a local nonprofit, Friends of the Santa Clara River, which both fills the Groundwater Sustainability Agency (GSA) seat as the environmental lead for the committee on the Fillmore and Piru Basins GSA, and fills the environmental representative seat on the Mound Basin GSA on the low Santa Clara River. She spoke to Clean Water Action’s communications manager about her work representing environmental interests in the Groundwater Sustainability Plan (GSP) process. What has been your experience of the GSP process? What challenges are you currently facing with that process? Ventura County’s Board of Supervisors passed a resolution by a 3-2 vote that authorizes environmental representation on new GSA boards formed under SGMA. Friends of the Santa Clara River represents environmental interests on Fillmore, Piru, and Mound Basins GSAs on the Santa Clara River watershed that straddles Los Angeles and Ventura counties. The purpose of this environmental representation is to ensure that groundwater dependent ecosystems, their beneficial uses and users are adequately considered in the GSP planning process, to promote active engagement of the local environmental stakeholder groups in the GSP process, and to ensure that GSAs comply with SGMA and all pertinent environmental regulations. The GSA for the Fillmore and Piru Basins has representatives from the County of Ventura, the City of Fillmore (a disadvantaged community whose sole water supply is dependent on groundwater), United Water Conservation District, the Fillmore Pumpers Association, the Piru Pumpers Association, and the Santa Clara River Environmental Groundwater Committee. Agricultural pumpers and water agencies did mount some opposition to environmental representatives being part of the GSA. As an environmental stakeholder, the biggest challenge that lies ahead is to define what is required under SGMA, how the GSP will comply with SGMA as well as other pertinent environmental regulation requirements, and how the GSA board will manage GSP development and longer-term operations within an overarching environmental regulatory framework. Ventura County was of the first counties to feel the effects of the statewide drought and up until very recently Ventura County was experiencing severe drought conditions. It is currently attempting to adapt to climate change and enhance the resiliency of its local water supply by diversifying its water supply portfolio through recycled water, stormwater capture, and achieving sustainable groundwater management. I became involved with the NGO Groundwater Collaborative because it offers solutions and (develops) pathways to help ensure smaller stakeholder voices (small family farms, environmental interests, and Disadvantaged Communities) are heard and incorporated in their respective GSP processes. What do you wish more people understood about the importance of groundwater sustainability in your basin? 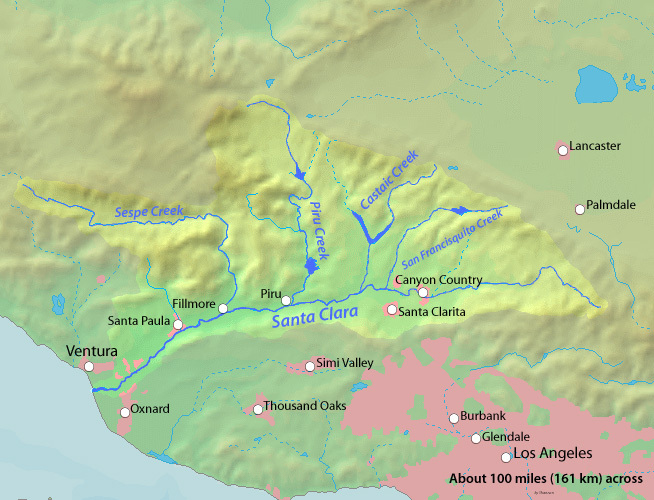 The Santa Clara River Basin historically supported the second largest salmon run south of San Francisco and is one of the largest basins in southern California that supports anadromous (migrating up rivers from the sea to spawn) runs of steelhead. The National Marine Fisheries Service’s Southern California Steelhead Recovery Plan and Wild Salmon Center identifies the Santa Clara River watershed as having potential to recover the species regionally, and sustainable groundwater management is a key strategy to Southern steelhead recovery. That is why Friends of the Santa Clara River, which is a founding member of the Santa Clara River Steelhead Coalition, is engaged in GSAs on the watershed and is encouraging steelhead advocates across southern California to do the same on their respective watersheds. Too often, endangered species and agricultural interests are pitted against one another as competing water resource users. However, the overarching goal of groundwater sustainability will support healthy fisheries and a local agricultural economy. Having representation on GSAs allows for stakeholders to dialogue on needs and solutions as a collective board, rather than argue from silos. A healthy run of Southern steelhead is indicative of a robust water supply, healthy groundwater basins, and adequate stream flow. Resilient fish are flagship species for so many groundwater dependent ecosystem users and uses. While having balanced representation on our GSA boards is the first step to successful GSP development, the next undertaking will be GSP objective setting that truly reflects the interests of all these stakeholders. Why is community involvement important in sustainable groundwater planning in your basin/s? GSP development is meant to be a stakeholder driven process, and representative stakeholder engagement–particularly for disadvantaged communities, small family farmers, and environmental interests, is essential to reflect these respective stakeholder needs. Community involvement will allow an avenue for beneficial users and uses to be adequately identified and addressed in GSP development. Relatedly, what outcomes are you most concerned about avoiding? What are the potential consequences of no involvement from community members and environmental groups? The City of Fillmore is considered a disadvantaged community, and their sole source of drinking water comes from groundwater. Ensuring their groundwater supply remains a sustainable source is imperative to the viability of the city and local residents. Environmental representatives have been advocating for the use of The Nature Conservancy’s 2018 Groundwater Dependent Ecosystems under the Sustainable Groundwater Management Act: Guidance for Preparing Groundwater Sustainability Plans framework. The Nature Conservancy’s framework outlines some initial steps, but environmental representation and input in the GSP process will be essential to framing further assessment and analysis that will likely be required to protect some 17 federally and state listed species found in the Santa Clara River watershed. Ensuring this stakeholder input is considered is a greater challenge in parts of the Santa Clara River watershed that fall outside of Ventura County, where environmental representation on new GSA’s is not the norm. Environmental stakeholders are well-informed on the environmental regulations that the GSAs must comply with. While SGMA regulations are driving this process, GSAs are still subject to compliance with a host of other environmental regulations, such as the California Environmental Quality Act (CEQA), Public Trust Doctrine, the Federal Endangered Species Act, Fish and Game Code, Clean Water Act, etc. A recent California County of Appeal for the Third Appellate District decision on the Scott River, a tributary to the Klamath River, found that California’s powerful public trust doctrine applies to groundwater resources, and that groundwater pumping cannot impair surface flows of navigable streams. The Santa Clara River watershed is home to a host of federally and state listed species and has been subject to numerous environmental litigation actions. Ideally, by having key stakeholders represented on the GSA’s, we can proactively try to balance the groundwater needs of people and the environment, rather than do so reactively through litigation. SGMA legislation and SGMA regulations contain an expanded definition of sustainability that includes avoiding undesirable results, one of which is changes to groundwater dependent ecosystems (GDEs) that have significant and unreasonable adverse impacts on all recognized beneficial uses of groundwater and related surface waters (Water Section 10720). Considering that Southern California steelhead was federally listed under the Endangered Species Act in 1997, the historical estimates for the Fillmore and Piru Basins sustainable yield will need to include enough groundwater supporting instream beneficial uses in the Santa Clara River or other GDEs. What specific steps are you advocating for in your basin/s? Aside from advocating for and securing environmental representation on the GSAs in Ventura County, I have initiated discussions with the State Water Resources Control Board to identify where synergies exist across SGMA regulatory requirements and other SWRCB standing programs and regulations, so we can either coordinate and/or complement these programs and leverage collective capacity and knowledge.